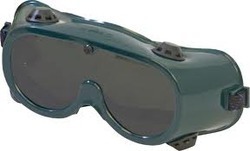 Pioneers in the industry, we offer welding goggles from India. We are one-step ahead of our competitors in offering a wide range of Welding Goggles. These are made using unmatched quality raw materials and by implanting best available technology. These are used to protect eyes from chemicals and sharp objects while working in the industries. Our goggles are available with us in various range and models as per the requirements and demands of clients. Looking for Safety Goggles ?